Black Catholic Ministries announces 2017 scholarship winners. 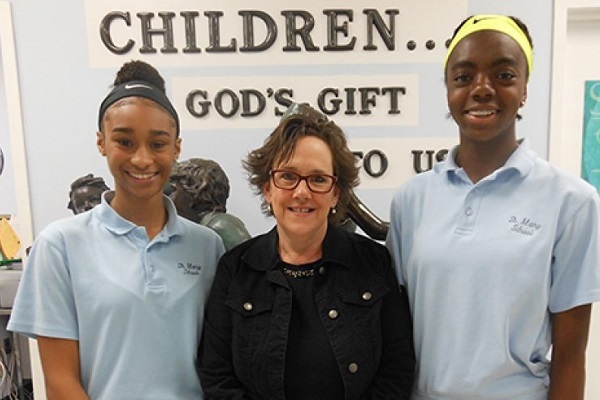 Three eighth graders will each receive a $2,000 award for freshman year at a South Jersey Catholic high school. 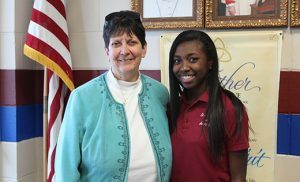 Pictured are Saint Michael the Archangel, Clayton, principal Janice Bruni with Giselle Williams. The 2017-18 winners are Janice Ashong (Saint Mary’s, Williamstown), who will attend Paul VI in Haddonfield; Sydney Prescott (Saint Mary’s, Williamstown), who will attend Our Lady of Mercy in Newfield; and Giselle Williams (Saint Michael the Archangel, Clayton), who will attend Camden Catholic in Cherry Hill. The Black Catholic Ministries scholarship winners are pictured with their elementary school principals. 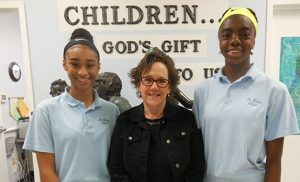 Above, Saint Mary School, Williamstown, principal Patricia Mancuso stands with Sidney Prescott, left, and Janice Ashong. Black Catholic Ministries director James Andrews said the field was especially competitive this year. “We had 15 applicants, and they were really impressive. It is so hard to narrow it down to three finalists,” he said. Applications are evaluated based on rigorous criteria, including school performance and activities, an essay and interviews.